The transition from using paper and writing to using a laptop and typing seems easy enough, but take it from someone who has made this transition twice now, there are always unforeseen challenges. Below are 6 tips on how to integrate smoothly. There are free systems and there are expensive systems, there are systems that simply chart, and there are systems that help with dispensing and billing. The EHR choice itself is dependent upon your clinic’s needs. My biggest piece of advice on EHR choice is to ensure you have a representative from the EHR provider who is available to guide you through the transition. This representative should be available for training in the beginning and then on call after that for any issues that come up after implementation. As we made the transition, we utilized our representative frequently and 1 year into using our EHR system, we still have weekly meetings with the company to work through any questions. Install devices in all treatment rooms. In this case, you would log on once in the room with the patient and log off before leaving the room. Use personal devices or those purchased by the clinic. This is the route our clinic (Federal Way Naturopathy – FWN) decided to go. This allows each practitioner to choose what’s comfortable for them - Mac or PC, laptop or tablet. When choosing a device, consider how you’ll be using it throughout the day – will you be carrying it around quite a bit? If so - lightweight and portable are crucial. In any case consider features such as battery life, and screen size. 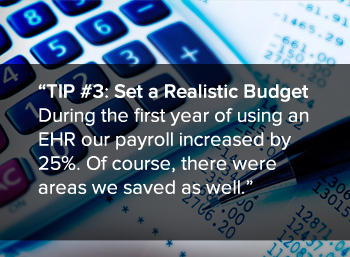 At FWN, our payroll increased by 25% over the first year of using EHR. Of course, there will also be areas where you save, including purchasing less paper, less printing ink, less staff time pulling and replacing charts, improved efficiency of physicians who are therefore able to see more patients, etc. Systems are all the protocols you have in place to make your business run – and often, these are by department. Each department should become the master of their domain and review every system that is in place before making the transition. Using an example from our clinic, when a patient calls with a question for the doctor, the nurse takes the patient question and writes it on a piece of paper. The paper chart is pulled, the note is attached, and it is then placed on the doctor’s desk. Once the doctor reviews the note, they respond and place the chart back on the nurse’s desk. The nurse then calls the patient with the doctor’s response and charts the conversation in the paper chart. Now, imagine this seemingly simple patient communication without the physical paper chart. How would this patient communication work if all the information was electronic? What is the new protocol that needs to be in place for this to still happen efficiently, without patient care declining or patient questions slipping through the cracks? You don’t have to have all of the answers heading into the EHR research phase, but having all your systems documented in advance will help to minimize those surprise challenges. Making the transition from paper to electronic charting requires a team of people. Not every practice has a member to fill each position in the team. This is the time to hire appropriate support staff. There are many things involved in the transition that you will not have time for if they continue with full patient care – (for more on how an EHR transition impacts the patient – see Dr. Lise Alschuler’s post on her personal experience during an EHR implementation). For example, all paper charts will need to be scanned into an electronic version. It will be important to designate or hire someone who will be able to review a chart and scan the appropriate documents in whatever organized way the EHR system has designed. This can be a full-time job all by itself, depending on the size of the practice. You may also consider hiring a “super-user”, a person who learns the new electronic protocols for all the different departments within the practice and is also familiar with the EHR system. This would also be a great time to take on a resident. All of the naturopathic medical schools have made the transition to electronic health records and having a new physician with EHR training will be incredibly valuable. Communication is a very important part of the transition from paper to electronic charting. During the process, I suggest having regular staff meetings to discuss any concerns, to review new protocols, and to continue to brainstorm ways to make patient care better with electronic health systems. During our transition, this did not happen enough and, at times, it resulted in multiple protocols springing up in regards to the same goal. For example, one nurse was charting medications differently than another, and when the doctor goes to look for the medication list, there are multiple places within the chart to check. If we would have reviewed the protocols together more often, all staff would be on the same page. Communication and standardization is the key.